Why is Inbound Marketing Important For Law Firms and Lawyers? What Is Inbound Marketing? Why Is Inbound Marketing Important For Lawyers and Law Firms? It’s become an industry buzzword that strives to differentiate current, digitally-based marketing efforts from traditional marketing practices. In it’s purest sense Inbound Marketing works to attract interested people to companies by creating and distributing informational content to potential consumers when they are ready, thus earning their attention. Traditional “Outbound Marketing” - often called interruption marketing, focuses more on “interrupting” people when they are focused on something else so that they pay attention to us when we are ready. Inbound strategies have a better chance of being accepted by our target audience than “interruption” tactics and being “in their face” at possibly the wrong time. Think of all the direct mail, billboards, telemarketers, and salespeople knocking on your front door. How do you feel about all of that? Receptive? Disturbed? Irritated? Inbound Marketing is the marketing of a company through various digital means such as: Videos, Blogs, eBooks, e-newsletters, white papers, case studies, testimonials, email, SEO, social media marketing, and other forms of content marketing. As Inbound Marketers - our job is to take these qualified “Leads” or “Strangers” and help NURTURE them in our “marketing funnel” until they become a customer. We do this by continuing to add value, provide quality information and by creating easy, convenient pathways for the “Lead” to convert into a customer. Inbound marketing earns the attention of customers, makes the company easy to be found online and draws customers to the website by producing interesting content. It’s about earning trust from the prospect also. Therefore, we must respect their time and not abuse the permission they have granted us to market to them. We provide relevant, reliable and timely information to educate, convince and convert strangers - into becoming valued customers. WHY IS THIS IMPORTANT TO ATTORNEYS, LAWYERS AND LAW FIRMS? It’s important for attorneys, lawyers and law firms for the same reason it is to the rest of the business world. We can only spend so many hours a day, talking to potential and current clients, media, referral sources, and those we consider our target audiences. With Inbound Marketing, the content we create and distribute is working for us 24 hours a day, 365 days a year, It’s there when our target audiences happen to need what we have to say. Consumers do their research online to learn what they need to know so they are better armed when they start interviewing a law professional to serve them. How do they become informed? EASY: By the content You have created and distributed for just that purpose. You have to figure out what clients are looking for that matches what you have to offer. Determine how you should describe what you have to offer in terms your clients understand. What types of questions do they ask you? That’s what you should write (blog) about. You then think about all the different ways you can create content that support what clients need and what you have. We love video to convey your message. People scan the web - but they will engage with compelling video. Create an Inbound Marketing plan that focuses on the constant, passionate delivery of relevant, timely content. Create ways to bring prospects into your “Funnel” and into a segmented email list once they arrive at your site. HOW DO YOU CREATE A CONTENT MARKETING MACHINE? Write to answer questions you are asked by clients and potential clients. Have a central blog administrator that reviews every blog and optimizes it. Use an editorial calendar and write around a central theme each month. Write as you speak; don’t force it. Don’t forget about human interest blogs. Share the impact and results. When setting goals and objectives, you have to be realistic in your expectations of marketing tactics and efforts. It is important to remember that Inbound and Content Marketing are just the same as any other type of marketing. Any marketing effort is not a sprint - It’s a marathon - perhaps an Ironman triathlon. (haha) Being impatient won’t get you anywhere but tired and burned out. However, the strategic, thoughtful, constant, passionate, relentless focus on the creation and distribution of good content will serve you much more effectively. 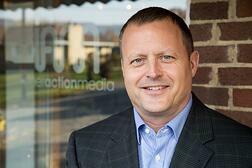 About Jim Matuga: Jim Matuga is a 33 year resident of Morgantown, WV. He graduated from West Virginia University with a BS in Advertising from the Perley Issac Reed School of Journalism in 1988. He has extensive experience in leadership positions with media companies in newspaper (The Dominon Post), television (WBOY – 12NEWS), cable (Rutter Media), direct mail (VALPAK), radio and Internet. Jim is 48 years old and is active in board positions with the Morgantown Area Chamber of Commerce, PACE Enterprises, Rotary Club of Morgantown, West Virginia BASS Federation and the West Virginia Miracle League. About inneractionmedia: iam is a 2013 Telly Award Winning Advertising Agency and Inbound Marketing Agency with proven expertise in providing marketing communications to connect organizations with their target audience personas. We have vast experience in marketing hospitals, healthcare, energy, attorneys, law firms, construction, higher education, tourism, the "expert industry", technology, banking, retail and real estate sectors. We are headquartered in Morgantown, West Virginia and serve the Pittsburgh, PA DMA as our primary market. The company was founded in 2011 by Jim Matuga and Michael Arbogast. Jim graduated from the Perley Isaac Reed School of Journalism at West Virginia University with a bachelor's degree in advertising and is a 31 year resident of Morgantown, W.Va. He has extensive experience in leadership positions with media companies in newspaper, television, cable, direct mail, radio and web. Jim is 52 years old and is involved with the Morgantown Area Chamber of Commerce, PACE Enterprises, Rotary Club of Morgantown, West Virginia BASS Federation and the West Virginia Miracle League.